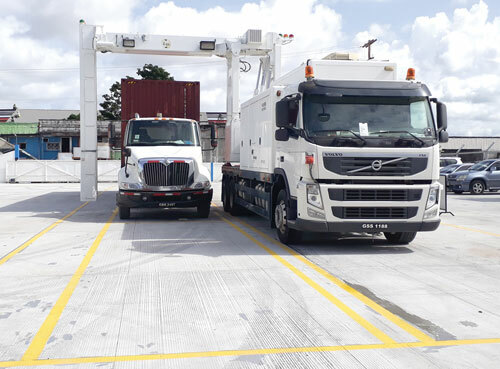 Almost two weeks ago, the Guyana Revenue Authority (GRA) commissioned a mobile scanner on Lombard Street, in a compound adjoining the Guyana National Industrial Company (GNIC). The scanner is a security requirement for Guyana and other countries that intends to continue to trade with the US and other countries. However, the operations of the scanner, or rather the sloth of the system, are giving truckers a major headache. As at 14:00hrs, yesterday, there were almost 20 containers waiting to be scanned. The line snaked from Lombard Street, straight along Sussex Street, heading along to the Cemetery Road direction. Some truckers were waiting since 09:00hrs, one driver said. It takes about 15 minutes to scan each container. A container truck being scanned, earlier this month. According to a spokesman for the truckers, he has a number of trucks. Several of the containers had lumber, scrap iron and rice. According to the truckers, there must be a faster way to process the containers. “They start work at 8am and finish work at 4pm. You are talking about the country’s exports. This is an example of the shortsightedness and stupidity that we have that creates more red-tape,” the spokesman said. In addition, the truckers are complaining about a US$100 fee now being introduced for scanning the container. He said that there are reports the a few containers missed their ships because of the delays. 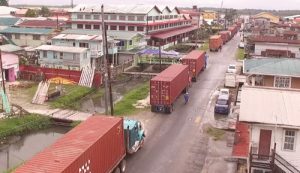 Since June 2016, Guyana had been without a functioning container scanner. It meant that the country was at risk with its exports, which could be tainted with illegal drugs, to countries, which have tough laws. With 80,000 containers annually coming to Guyana, the challenge of developing a system of checking containers, especially for high-risk businesses, is very real. It gets even tougher when some of the empty containers are being shipped out back. Things ended up in some of them. The wharves had no way of checking 100 percent of those containers. Coupled with corrupt wharf and Customs officials, the challenges were monumental, GRA and other officials said this month when the mobile scanner was being commissioned. The compound was being constructed with funding by the GNIC, with more than US$1M spent. GNIC under the arrangements would be able to recoup its costs. 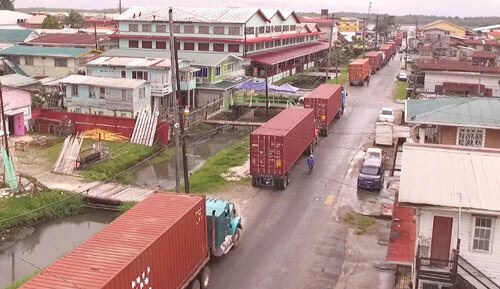 The authorities, in especially the US, which has introduced tougher port laws since 9/11, were wary of Guyana but stopped short of stopping altogether any shipments from Guyana. The line of trucks waiting on Sussex Street to be processed at the Lombard Street container scanner compound. In a few months’ time, GRA is hoping to also commission a fixed scanner at one of the wharves. In the absence of the container scanner, the system was a burdensome one where Customs and other officials had to be booked in advance. The manual system was open to fraud. During the last two years, the checks on incoming and outgoing containers took a strain, with GRA forced to introduce profiling of businesses. The mobile container scanner, the GNIC official said, was manufactured by Chinese-owned Nuctech, which has been doing similar business in over 130 countries, including security at Olympics and summits. It is fitted in a Volvo truck.